The Knights Templar send Jack Slade to the ancient Assassin stronghold of Alamut to recover a magical book hidden among the ruins. The Black Brotherhood, however, has different plans. Accompanied by a beautiful young woman, Slade battles Brotherhood operatives and astral demons from the Caspian Sea, across Europe and then to Paris in an epic struggle to accomplish the mission. Jack Slade opened his eyes and stared up at the polished oak beams spanning the ceiling of his bedroom. The sunlight of a bright spring morning streamed in through the open window. He lay on his back, idly pondering the particles of dust dancing in the rays. Feeling refreshed after a good night’s sleep, he threw back the black satin sheets, swung his long, muscular legs over the edge of the bed and stood up. Wearing only his boxers, he padded barefoot across the carpeted floor and went into the bathroom. Later, he emerged with his face washed, his black hair combed straight back, wearing sweat clothes and rubber-soled canvas shoes. Leaving the bedroom, he walked down the hallway to the kitchen. Ellen, his cook and housekeeper, was rinsing the previous night’s dishes and putting them into the dishwasher. A widow in her late forties, she had grey-streaked brown hair, a short plump body and a pleasant, good-natured face. She had been with Slade for five years. “Good morning, Ellen,” Slade said cheerfully. “Good morning, Mr. Slade,” she replied, glancing at him over her shoulder. Sinks and cabinets lined one wall of the spacious kitchen. A restaurant-style stove rested against another, and a huge refrigerator-freezer stood against a third. Slade moved to the counter running through the center of the room and picked up the glass of milk Ellen had set on the polished granite top. As he sipped it, he gazed out the large window in the opposite wall at the Japanese garden extending north and west until it butted against the tree line of a pine forest. His grey eyes roved appreciatively over the ferns, colorful flowers and bamboo trees, rock lanterns and fountain. The fountain fed a rock-lined pool, and a kaleidoscope of colors flashed over the surface as the sun’s rays reflected off the fish darting in its depths. His gaze came to rest on the twenty by thirty foot wooden platform set squarely in the middle of the garden. Slade went out a side door and walked through the garden along a path of irregularly placed stones until he reached the platform. A tall wooden frame supporting curled sheets of thick clear plastic edged the deck. When it was cold or raining, or excessively hot, Slade lowered the curtains to seal off the platform. A heating and cooling unit concealed among bushes on the side allowed him to control the environment so as not to be disturbed by the vagaries of the weather. As he stepped onto the deck, a change came over him. This was where he trained, where he honed his hand-to-hand fighting skills. He never lost sight of the fact that in Asia the fighting arts are sacred; they are considered paths to enlightenment. In fact, in Japan, the term ‘dojo’ means ‘way place’ or place for studying the Way—the Way of the Warrior. As Slade moved through his warm-up stretches, he sank down into himself, centered his awareness in his lower abdomen and extended roots deep into the ground beneath his feet. The sunlight was warm on his head and body, helping him bring his muscles, bones and joints to a state of vibrant aliveness. When he was ready, he moved to one end of the platform where a teakwood dummy hung suspended on slats attached to two wooden posts sunk into the ground. The dummy had two upper arms, an arm at the mid-line and a leg curving down to the deck so he could practice his techniques in as realistic a manner as possible. 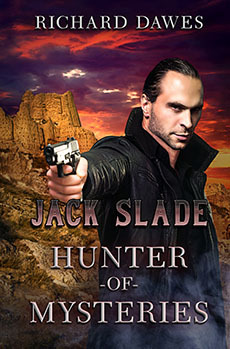 For the next two hours, interspersed with short breaks, Slade glided around the dummy, drilling his fighting techniques at combat speed and striking the padded surfaces with full force. As he moved, his mind gradually released itself from specifics and entered a state he called witness consciousness. No longer focused on particular moves, centered in the spine and root, his mind expanded spherically until it encompassed everything and nothing, controlled the action without controlling anything. His movements became effortless and spontaneous as he entered a state of ecstasy. The sun passed its apex and rolled toward the west, bringing Slade back to normal reality. Drenched with sweat, he picked up a towel and dried his face. Still in a state of exultation, his body feeling like electrified rubber, he took the stone path back to the house. A broad lake was just visible through the pine forest down the slope to the west, and he paused to watch sunlight dance and shimmer over its rippling surface. He moved down the hall, listening to Ellen puttering about, dusting furniture. Glancing at a phone as he went by, he noted there had been no calls. Later, after a shave and a shower, with one of Ellen’s good lunches resting comfortably in his stomach, Slade stepped outside and walked along the short, covered walkway to his study behind the house. The sun was sinking below the tops of the trees, and the garden floated in a shifting sea of purple shadows. A cool breeze drifted up from the lake, whispering softly as it wafted through the pines. Slade opened the door, entered the study, then paused and breathed a deep sigh of pleasure. The study was his headquarters when at home—his sanctum sanctorum. Lamplight threw a mellow glow over walls lined with bookshelves crammed with books, many quite ancient and rare, that Slade had collected from all over the world. A huge globe rested in a mahogany stand in one corner, while a small, select collection of bladed weapons—swords, daggers and dirks—adorned a narrow space between two bookcases. Moving past cushioned chairs and a small sofa set in the middle of the carpeted floor, Slade approached his desk—a long, ornately carved mahogany bench—sitting beneath a window overlooking the garden. Besides his computer, reference books and pages filled with notes from a project he was working on cluttered the top. Irresistibly, his gaze came to rest on a thick, leather-bound tome lying open on the desk. It was a thirteenth century treatise on alchemy. The yellowed, moth-eaten pages were made of parchment, the margins illuminated with esoteric drawings, the text hand written in Latin. He paid a considerable sum for the book from an antiques dealer the last time he was in Paris. Now he was translating the text into English. Fired with enthusiasm, he sat down and drew the book toward him. Then he paused and glanced at a phone sitting on the desktop beside an ancient, fanged, human skull. On impulse, he picked up the receiver and dialed a number. “Carlyle’s Firing Range,” came the gruff response. Slade replaced the receiver and sat for a moment, lost in thought. Jeff Carlyle was an ex-FBI man. He opened a firing range when he retired to keep himself busy and to escape the watchful eyes of his wife. At considerable expense, he installed an obstacle course—more a maze, really—that closely simulated urban combat conditions. It provided pop-up, surprise targets at every turn. Carlyle changed the targets’ positions regularly so his patrons wouldn’t get used to seeing the same images in the same places and start reacting from habit. Although Slade utilized the stationary target range—he often used it to warm up for the obstacle course—he considered the urban setting and the moving targets more useful in his line of work. His evening planned, Slade pulled the text on alchemy toward him and continued with the translations. The buzzer on Slade’s cell phone went off. Immersed in the esoteric principles of alchemy, he had lost track of time. Glancing up from the page he was studying, he noticed it was already dark outside. A full moon danced over the tops of the pine trees. Grunting with irritation, he reached into his pocket, pulled out the phone and put it to his ear. “Good evening, Jack,” said a cheerful voice. “Immediately,” came the cheerful reply. Slade hung up and stared into space for a moment. Then he reached for the desk phone to call Jeff Carlyle, canceling his shooting reservation.